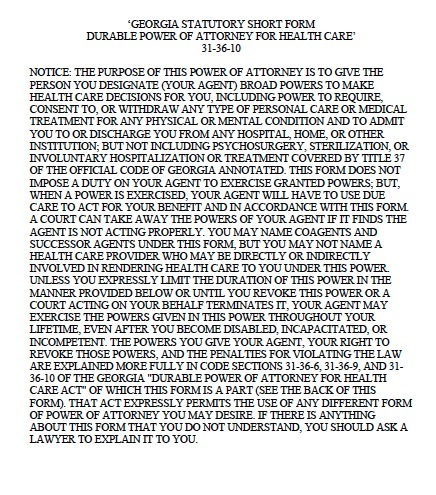 Also known as an “advanced health care directive” or “durable power of attorney for health care”, recognizes your right to be in control of all aspects of your medical choices and decisions. This document allows you to specify treatments that you would or would not like to receive in the future if you become incapacitated and unable to specify them yourself. For example, if you suffer a traumatic brain injury, you may be in an irreversible coma and not able to survive without artificial hydration and mechanical breathing. Many people would rather discontinue life-sustaining treatments under these conditions because there is little quality of life. If you lacked an advance directive stating that you want to end life support, your family and doctors may choose to continue the treatment indefinitely. In Georgia, two witnesses must be present when the principal signs the directive and confirm that the principal holds the mental capacity to enact the document. The agent, beneficiaries of the principal, and anyone directly involved in the principal’s health care cannot qualify as witnesses. If the principal would just like to select their end of life treatment options without the use of an agent he or she should be advised to fill out the living will.